The primary reason to run a customer journey mapping project is to drive customer-focused change. 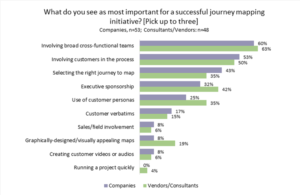 That’s what we heard when we asked customer experience practitioners to rate their success with their journey mapping project. 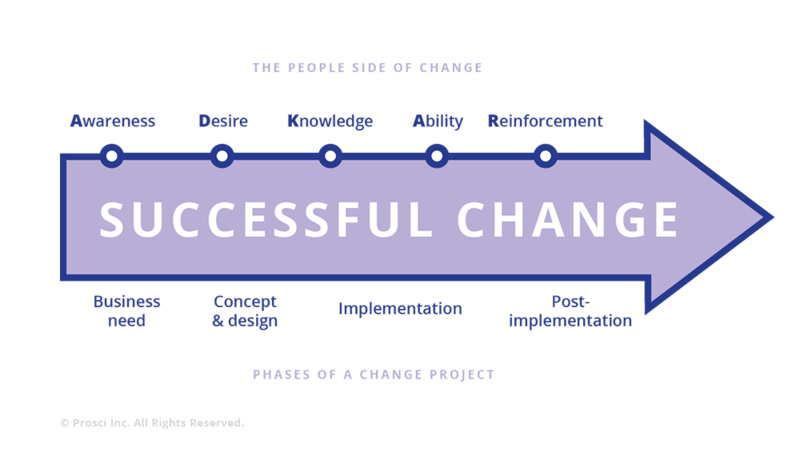 A successful journey mapping project is one where change is made from the results. We use this model as we prepare for customer journey mapping projects, and particularly as we help clients communicate the results to their organization. Failing to use a solid methodology was one reason that so many journey maps end in failure. Let’s look at the ADKAR change model and apply it to customer journey mapping. The model is typically (but not always) sequential in nature. Before you can create a better customer experience, you need to be aware of the need to improve, but you also must want to change. Many change programs fail because they assume that communication will solve the problem. While communication can help your teams understand that change is needed, that’s hardly sufficient. I know that cookies are bad for me. But telling me that doesn’t make it any easier to avoid them! Until your employees have the desire to do things differently, they’ll quickly go back to their old ways. A journey mapping project is primarily aimed at the Knowledge part of the model. When a customer calls us, the person talking with us typically knows that change is needed, and they almost always want to drive change. But they typically don’t know just what needs to be changed or how to change it. Journey mapping fills this gap. The biggest problem CX pros make is to assume this is sufficient – they now have the knowledge, so everything should be ready to change, right? Of course, that’s not how it works. While our direct client is at the Knowledge stage of the model, their broader employee base is often unaware of the need to change or lacks the desire to change. That’s why participants in our survey said that the most critical factor in a successful journey mapping project is to “Involve a broad, cross-functional team.” Involving a broad team accomplishes two things: it spreads the awareness of the customer friction points discovered during the journey mapping project, and, more importantly, involving a broad team creates ownership in the need to change, creating a team of people to lead the efforts. Communicate the customer pain, and the need to alleviate it, out to your company. Company-wide communications, training, and customer rooms are all good ways to get the word out. This goes after both Awareness and Knowledge. Engage your leadership. Help them tell the customer story found in your journey map. While a bottoms-up approach may seem appealing, it’s unlikely to work. Executive sponsorship helps drive the desire to change. Design interventions to drive the Ability to change. How this is done varies substantially, depending on the findings. It could involve giving customers more tools, driving word of mouth, or even making it harder to become a customer. Ensure executives keep talking about it, providing the Reinforcement needed to maintain the change. 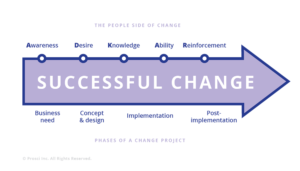 If you’re one of the majority whose journey mapping projects failed, look to see if you’ve analyzed and executed on the five steps of the ADKAR change model.